Summer is in full swing here in Saint-Tropez, and as we get closer to late July, all indications are that the resort will be super-packed this season unlike any other time in recent memory! Stars, socialites, dignitaries, and the most discerning luxury travellers of the world are descending on Saint-Tropez for July and August . . .
. . . will you be here with us as well? On your behalf, I have worked tirelessly along with my operations and sales team throughout the winter to hand pick the finest luxury villas in Saint-Tropez and Miami. As you know, Villazzo doesn’t just rent you a villa – in our famous “VillaHotels”, we set up a private five-star hotel just for you before your arrival (and convert it back to owner use after your departure). The vast majority of our top VillaHotels and “V” Villas in Saint-Tropez were booked solid back in the spring. There are, however, a select few properties with very limited availability during Saint-Tropez’s peak season! In order to make a Villazzo Summer vacation a reality for you, we are offering an exclusive 10% off promotion on the remaining summer dates for one of our top Saint-Tropez VillaHotels! In addition, we have a recently added “V” Villa offering, as well as some availability at one of our top properties. Be sure to read below for all of the details. These last-minute offerings are perfect reasons to finally book your summer Saint-Tropez vacation with Villazzo at one of our exclusive VillaHotels and “V” Villas, and get a great deal in the process! And don’t forget: while Saint-Tropez is buzzing, it’s the low season in Miami Beach. If you love Miami in the summer, we have some absolutely incredible deals that you simply cannot pass up! Be sure to read about our highlighted VillaHotels and “V” Villas in both Saint-Tropez and Miami below, and contact us if you have any questions about the properties and available Summer dates for your vacation plans. Thank you as always for choosing Villazzo – we look forward to giving you the luxury vacation of a lifetime! A Few Spots at Select Saint-Tropez VillaHotels Still Available For Summer! We have an amazing deal on our “V” Villa Sogno di Luce that you simply cannot pass up! Villazzo is offering over 10% discount on Sogno di Luce if you book a vacation between August 1st and 12th – the peak of Saint-Tropez’s summer season. This reduces the weekly booking rate from 46,200 € to 39,999 €! This magnificent 6 bedroom, 6 bathroom villa is perched atop a high hill with a commanding seaside view, and puts you close to all of the action. 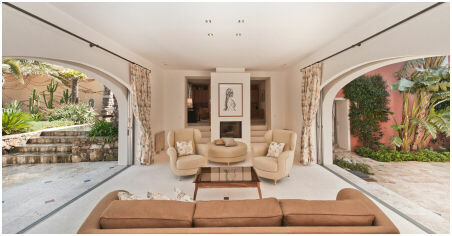 Now is the time to take advantage of this great deal on one of our finest “V” Villas in Saint-Tropez! 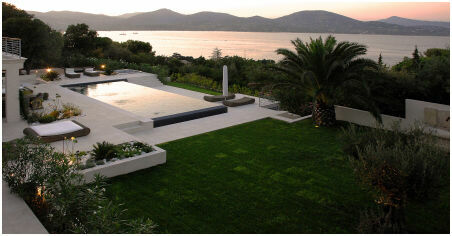 Another available option in Saint-Tropez this summer is newly-added “V” Villa Kim. Located in the coveted Domain de Sinopolis near “V” Villa Sogno di Luce , “V” Villa Kim gives luxury vacationers a spectacular, hilltop view of the sea! Its 4 bedrooms and en-suite bathrooms are surrounded by beautifully decorated living and dining areas, as well as a garden-rich exterior, complete with teak terraces, swimming pool, and outdoor Jacuzzi. 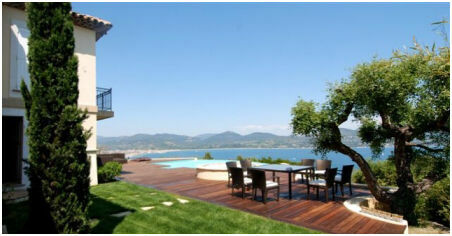 For this property Villazzo offers a special last minute rate of 13,100 € for a week, hurry up to get this amazing deal! “V” Villa Solea is also still available for the start of peak season in Saint-Tropez – we have availability from July 15th through the 31st. Solea features a unique floor plan that really brings the sun and warmth of Saint-Tropez in summer into the villa experience. And with 5 bedrooms and bathrooms, it has ample room as well. Finally, we have some exciting, late-breaking news on Villazzo in Saint-Tropez: we are just about to add a phenomenal new property — similar in style to “V” Villa Kim — that will have full availability for the remainder of Saint-Tropez’s peak season! This brand new, 4 bedroom beauty is close to Tahiti Beach, and very nice. Contact us if you’d like to hear more about it! Villazzo Miami VillaHotels Are A Great Deal in the Summer – Take a look! Miami Beach’s Palm Island can be described as nothing less than “luxury on luxury” – an ultra-exclusive community of the finest properties in all of Miami. VillaHotel Contenta is truly one of the finest luxury villas of Palm Island, with 11,000 sq ft, 6 bedrooms with spa-inspired en suite bathrooms, spectacular views across Biscayne Bay towards South Beach, and a magnificent pool, terrace area, and plenty of privacy and luxury amenities that, along with Villazzo’s 5 star hotel-inspired VillaHotel services, make VillaHotel Contenta the luxury villa of choice in Palm Island. VillaHotel Contenta features an amazing low season rate of 50% off peak season, at just $8500 a night for a weekly booking. Some dates are still available for summer – please enquire. With architectural details that conjure the splendor of Alhambra Palace, VillaHotel Jasmine offers Miami Beach vacationers a Moorish-style luxury villa experience on an exclusive waterfront property. The 8,500 sq ft, 6 bedroom, 6 en-suite bathroom mansion features a modern, open floor plan with chic Indian and Moroccan-style furnishings throughout. Outside, an ultra-private terrace, garden, swimming pool, and Jacuzzi make VillaHotel Jasmine the perfect choice to luxury travellers. We have an exclusive summer promotion for VillaHotel Jasmine: in addition to Jasmine’s low season rate of $7300 a night, we’ll add an additional 20% for any weekly summer booking. Take a look! We also have a host of other stunning Miami properties available throughout the remainder of the summer, such as VillaHotels Valentina and Catia. You can take a look at all of our Miami properties here. If you’re ready to make plans for your summer vacation experience, don’t delay! These incredible deals are going fast, and summer will be over before you know it! Contact us to check on availability for all of these fine Villazzo properties. This entry was posted on Thursday, July 14th, 2011 at 8:46 am	and is filed under Villazzo Newsletters. You can follow any responses to this entry through the RSS 2.0 feed. You can leave a response, or trackback from your own site.